A team of researchers with the University of Antwerp and the University of Ghent, both in Belgium, has uncovered the means by which roosters prevent themselves from going deaf due to their own loud crowing. In their paper published in the journal Zoology, the group outlines their study of the birds and what they found. Anyone who has ever lived on a farm has heard the familiar sound of the crowing rooster (male chicken). Few likely realize, however, just how loud that crowing can be. 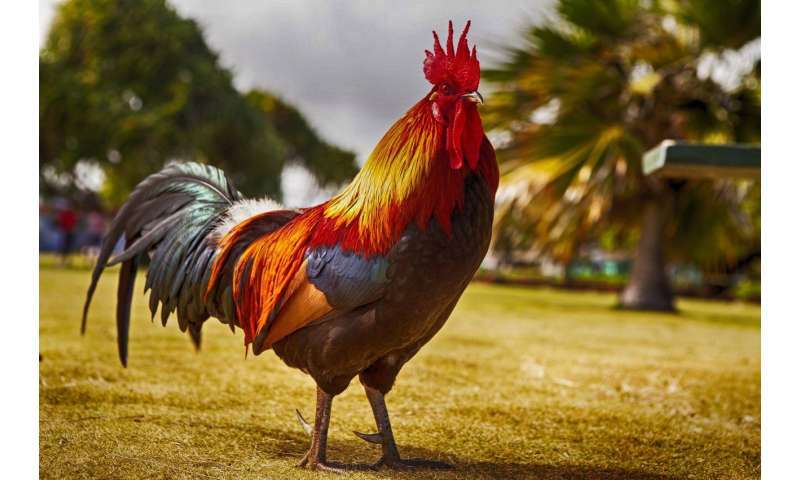 In this new effort, the researchers sought to measure how loud the crowing is, and how the rooster avoids deafness from hearing itself every morning. The team placed a tiny microphone near the ears of sample roosters to measure how loud the crowing would sound to them. They found it was louder than thought—averaging over 100 decibels, which is roughly the same as running a chainsaw. People who regularly use chainsaws without ear protection, it should be noted, go deaf over time due to damage to the tiny hair cells in the inner ear. Chickens of both genders also have such hairs in their ears, and the team wondered why they weren't damaged. To find out, they performed micro-computerized tomography scans on the skulls of the birds. They discovered that half of the birds' eardrum was covered by a bit of soft tissue that dampened incoming noise. They also found that when the rooster tilted its head back to crow, another bit of material covered the ear canal completely, serving as a built-in ear-plug. Thus, for the rooster, it is as if someone were sticking their fingers in their ears while they are crowing. The researchers noted the birds also have another advantage—unlike humans, birds can regrow damaged hair cells. As for why the hens and chicks do not suffer hearing damage from the male crowing, though not mentioned in the research, it is well known that roosters tend to seek a vantage point offering maximum reach when they crow (away from the hens and chicks), making sure everyone within earshot knows that the hens that live there are his. High sound pressure levels (>120 dB) cause damage or death of the hair cells of the inner ear, hence causing hearing loss. Vocalization differences are present between hens and roosters. Crowing in roosters is reported to produce sound pressure levels of 100 dB measured at a distance of 1 m. In this study we measured the sound pressure levels that exist at the entrance of the outer ear canal. We hypothesize that roosters may benefit from a passive protective mechanism while hens do not require such a mechanism. Audio recordings at the level of the entrance of the outer ear canal of crowing roosters, made in this study, indeed show that a protective mechanism is needed as sound pressure levels can reach amplitudes of 142.3 dB. Audio recordings made at varying distances from the crowing rooster show that at a distance of 0.5 m sound pressure levels already drop to 102 dB. Micro-CT scans of a rooster and chicken head show that in roosters the auditory canal closes when the beak is opened. In hens the diameter of the auditory canal only narrows but does not close completely. A morphological difference between the sexes in shape of a bursa-like slit which occurs in the outer ear canal causes the outer ear canal to close in roosters but not in hens.